A wildfire in Glacier National Park more than doubled in size over the weekend, prompting more evacuations and a warning that Apgar is now in the Howe Ridge fire’s potential path. Incident commander John Pierson’s team estimated the fire’s size at 7,835 acres on Sunday – up from 3,500 acres a day earlier. That flare, along with predictions for increased winds, prompted Glacier Park to evacuate the Fish Creek Campground and the Fish Creek Ranger Station residence. Fish Creek Campground Road was closed from the Camas Road junction, as were all trails off the Camas Road. Then came the evacuation warning to the town of Apgar, located inside the national park boundaries, as well as Grist Road and all areas accessed via the Quarter Circle Bridge Road. That means residents and workers in those areas can remain for the time being, but should be packed and ready to leave at a moment’s notice should the fire move too close. Evacuation orders already were in place for the North Lake McDonald Road (private residences and the Lake McDonald Ranger Station), Lake McDonald Lodge area (all businesses, employees, and private residences), private residences along the Going-to-the-Sun Road, and the Sprague Creek and Avalanche campgrounds. In addition, Glacier Park Lodges Inc. announced on Friday that Lake McDonald Lodge will not reopen this season. The lodge had been evacuated when the prior weekend pushed the Howe Ridge fire from 20 acres to 2,500. It is the second consecutive year that the lodge has closed a month or more early because of an approaching wildfire. In 2017, the historic wooden structure closed on Aug. 30 because of the Sprague fire and a thick, unhealthy blanket of smoke that settled into the McDonald Valley. 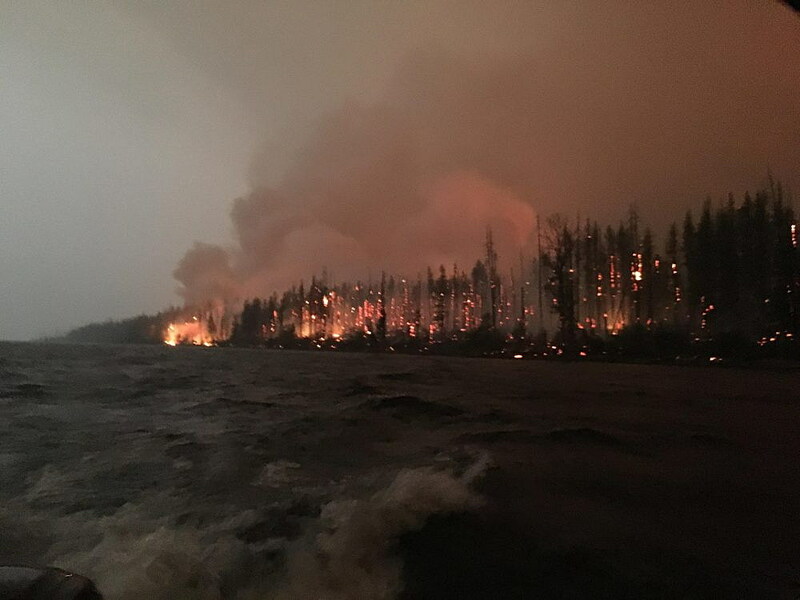 This weekend, the Howe Ridge fire was driven by down-valley winds into heavy dead fuels left on the west side of Lake McDonald by the 2003 Robert fire, Pierson’s team reported Sunday. While much of the Howe Ridge fire’s prior growth came on its north and northwestern edges, this weekend’s run came on the south and southwestern flanks. The weather forecast didn’t help. Said Pierson’s latest update: “A weather system is predicted to bring slightly cooler temperatures, but the frontal passage will increase winds and cause shifts in wind directions. For a recorded fire update from Pierson’s team, call (406) 888-7077. For Glacier National Park trip planning information, visit www.nps.gov/glac or call (406) 888-7800.